I had been searching for the perfect calendar. I wanted a wall calendar, but I just couldn’t find one that went “POP”. Then one day I was in a store and found the perfect one. 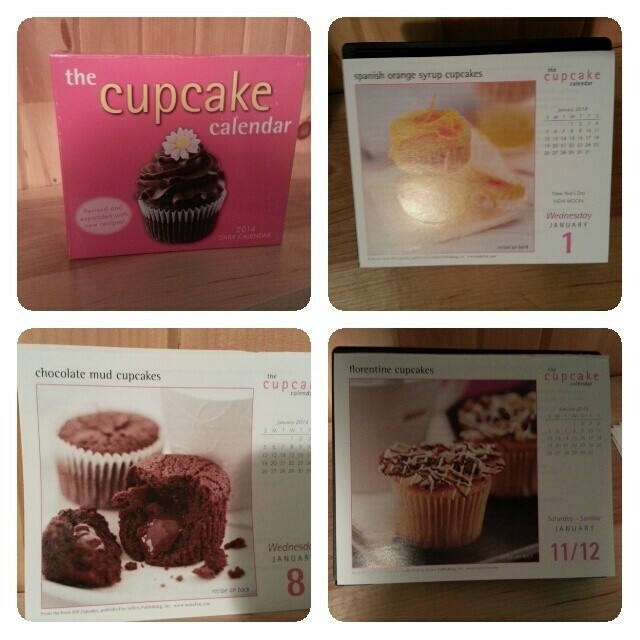 The Cupcake Calendar. Do you know what is so great about this calendar? There is a cupcake recipe for every day of the year. Mind you, there is a recipe and then follows 2 – 3 variations of that recipe, but hey, I’ll take it. The best part of this calendar are the recipies. So often I will look at cupcake recipe books, like the “Cupcake Bible” (which I own) and the recipe is not from scratch. It always calls for a cake mix from a box. What kind of cupcake is that if you are trying to do gourmet cupcakes. These recipes have no mention of cake mixes! Wonderful. I decided that I would try to make at least one batch of cupcakes a week. That might be over kill, especially as the school semester gets heavy, but I promise that when I do make one of the recipes, I’ll photograph the cupcake, have my people test them, and share the results and the recipe with you! For a heads up, all you people who enjoy recipes on FB, I won’t be doing that. You will have to venture over to my blog to find the recipe. But I’ll post a picture of the cupcakes with the link to the post featuring the recipe so it’s still easy for you to get too. Be sure to share the photo and link with your friends! Did you know? I have a FB page! You can find it by searching “Jackman’s Cupcakes & Steeped Tea” You can even “like” my page right form this blog. It should be in the side somewhere. Remember, Keep Calm, and Eat a Cupcake.